Feeling a tad busy this season? Join the club. But in spite of our harried schedules, we can all still give heartfelt, homemade gifts the recipients will love. So, we did the work for you. Here are 6 simple ideas that take just a few minutes, easy recipes and even the printable gift tags. 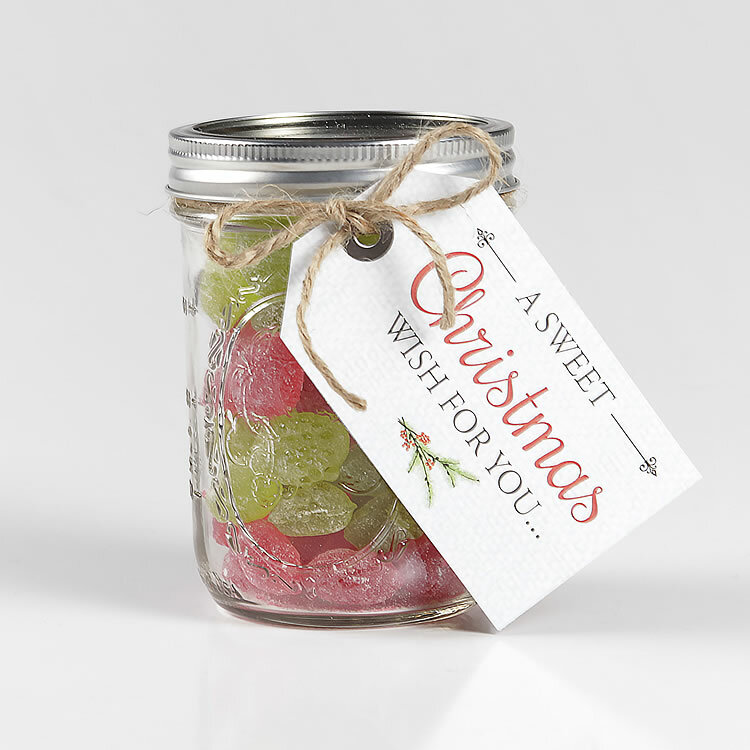 We had a blast whipping up these simple, yummy jar gifts in our office, and we think you’ll have fun with them, too. Rest assured, you won’t break the bank, and of course, everyone will love not only what’s in the jars, but the jars themselves! Our mini glass milk bottles are ideal for jar gifting, enjoying your favorite drink and/or storing dry goods! Set of 6 at Lehmans.com and our store in Kidron, Ohio. We just can’t get enough of these little glass milk bottles. They’re the perfect size — 1 pint — and shape for serving milk (with cookies, of course), juice, sodas or even smoothies. This simple mix makes a rich, creamy cup of cocoa that’s not too sweet (so a few mini marshmallows are the perfect addition). The cinnamon gives it a little flair. If you want to go really “Mexican,” add a dash or two of cayenne pepper, but you may want to warn the giftee! In a mixing bowl or batter bowl, mix all ingredients together with a spoon or whisk. Take care to smooth out any lumps of brown sugar or spices. Fill jars about 2/3 full, then place mini marshmallows on top and secure lids. Attach gift tag with ribbon, twine or raffia. Nice big 1.5-pint jars make a generous gift – and a great drinking glass when the mix is all gone! At Lehmans.com and our store in Kidron, Ohio. This hot drink mix is a take-off on instant wassail mixes. It requires just a few ingredients and is caffeine-free, so it’s kid-friendly, and it packs a Vitamin C punch, too. Adjust the sugar to taste – using the full amount this recipe calls for results in a pretty sweet drink. You can also increase the spices if you want a “spicier” flavor. In a mixing bowl or batter bowl, mix all ingredients together until well blended. Fill jars and secure lids. Attach gift tag with ribbon, twine or raffia and 1-2 cinnamon sticks. Not your mother’s canning jars: These jars’ unique shape makes them a memorable and appreciated gift! At Lehmans.com and our store in Kidron, Ohio. Because c’mon, who doesn’t love popcorn? Mix different varieties and colors together or pick your favorite kind and go plain and simple. We layered GMO-free purple and white popcorn for a festive look. Sweet hard candy is always a favorite. We layered Claey’s old-fashioned sugared wild cherry and green apple candies. Old-fashioned peppermint puffs would look gorgeous, too. Know someone who LOVES black licorice (and we all do, right)? Fill a pretty clip-top jar with these little black anise bears and add our “Beary Merry Christmas” tag. Voila – done and delicious! An easy and thoughtful way to say, “I love you. You’re important. Take some time for yourself and relax.” Mix 1 cup Epsom salts with 1/4 cup baking soda and 1/4 cup natural sea salt, then add 8-10 drops of their favorite essential oil – we love lavender. Mix well in a small bowl, then pour into a mason jar (we used Ball’s cool blue Elite jars). Add a small scoop and our “Merry Christmas” wood ornament as final touches. These old-time clip-top jars make a rustic presentation for all your jar gifts! At Lehmans.com and our store in Kidron, Ohio. BONUS – We couldn’t resist filling an ADORABLE Kilner round clip-top jar with some of our exclusive Chocolate-Drizzled Potato Chip Caramel Corn. It truly doesn’t get any easier, and everyone will think you made this addictive concoction yourself! (Shhh – we won’t tell.) Seriously though, these jars are so attractive, you could fill them with anything and they’d make a great gift! Make sure ALL jars, lids and bands are clean, either washed in the dishwasher or by hand with hot, soapy water and COMPLETELY dry before filling. Use a large batter bowl to mix your dry ingredients (such as wassail mix and cocoa mix). This makes it easier to pour the mixes into jars. When filling your jars, use a canning funnel or other funnel. No spills! Put on some festive Christmas music and enlist the help of the children to mix dry ingredients in the bowl. Slow down, take your time and have FUN. Use our FREE printable Holiday Jar Gift Tags! Print out the ones you need again and again. It’s our little present to you. Happy jar gifting! Editor’s Note: This article was originally published in November 2016. By popular demand, we’re sharing it with you again – enjoy!